Wednesday&apos;s action - affecting a Docklands Light Railway (DLR) train at Canary Wharf - caused minor delays. A campaigner who had glued himself to the train&apos;s window was removed about an hour after the start of the DLR protest, at about 10:50 BST. 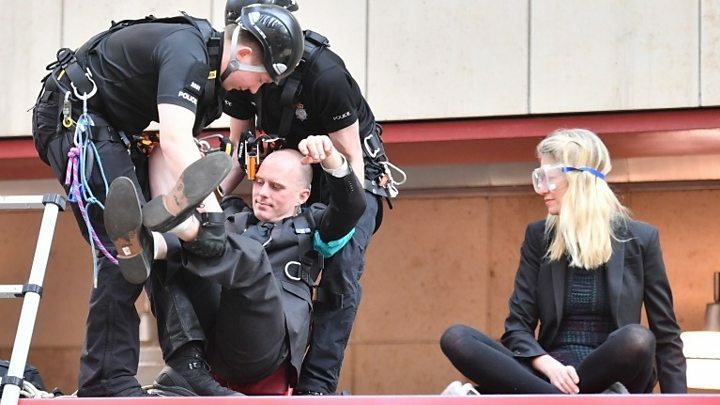 A man and a woman who unfurled a banner and glued themselves to the top of the train&apos;s carriage were also later removed and carried off by officers. Protester and climate lawyer Farhana Yamin, who was arrested on Tuesday, earlier told BBC Radio 4&apos;s Today programme: "I totally want to apologise to people using public transport. "But at the same time we need to take actions that are disruptive so everyone understands the dangers we&apos;re facing right now. People should understand that we are at a critical moment in our humanity&apos;s history." Jace Tyrrell, chief executive of the New West End Company, said the first two days of protests had so far caused a loss of �12m in trade in the West End. The 58-year-old said: "We&apos;re trying to make a living and we can&apos;t. We move very quick in this country, this is only going to slow down everything." Three men and two women, in their 40s and 50s, arrested on suspicion of criminal damage at Shell&apos;s headquarters in London on Monday, have since been released while inquiries continue. It has three core demands: for the government to "tell the truth about climate change", reduce carbon emissions to zero by 2025, and create a citizens&apos; assembly to oversee progress. The government said it shared "people&apos;s passion" to combat climate change and "protect our planet for future generations". A spokesman said: "We&apos;ve asked our independent climate experts for advice on a net zero emissions target and set out plans to transition to low emission vehicles and significantly reduce pollution through our Clean Air Strategy." Published on Wed, 17 Apr 2019 11:32:58 GMT, © All rights reserved by the publisher.